Us standing around one of the gates at the event. To begin with, what is the worlds scholars cup?? 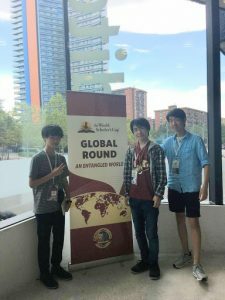 The worlds scholars cup or WSC is a program founded by, Daniel Berdichevsky, and was aimed to let young students (From 7~9th grade classified as the juniors division, and 10~12th grade classified as the seniors division) to fall in love and find the fun that is hidden beneath learning. The event is held every year and consists of three rounds. The regional round, the global round, and the Tournament of Champions which is also known as ToC. Over 70 countries from around the globe join this event. In the regional round teams represent their own schools, and on the th global rounds we not only represent our school but also our own country. 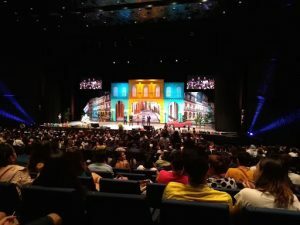 Around 500 people from over 3000 get qualified to go to ToC in the global rounds, however before that it is necessary to win in the regional rounds thus making the competition harder. The competitions evaluates you under its 6 major subjects, those being Literature, Social Studies, Science, Art & Music, History, and a Special Area which changes every year, this year being “Human Relationships”. I can’t fully describe in words what I felt within the 9 days I spent in Spain. What I can say confidently though is, it was a feeling that I would have never been able to experience if I haven’t joined the world scholars cup. I met people from all around the world, Korea, India, Turkey, Kenya, you name it!! I met so many people from so many different backgrounds and schools, made new friends and created new relations with other people from around the globe. In the scholar’s challenge we dived in and utilized the knowledge we had and worked individually to support our team. During collaborative writing we used the techniques and writing styles our teacher in school taught us, constantly helping each other, improving places where we weren’t good at, and fixing each others essays during the last minute. The team debate. Tackling motions that varied across most of the subjects. And lastly the scholars bowl. Getting harder and harder after question to question. And the occasional arguments of whether the clicker was working. We of course did not only study every second at the moment, but also enjoyed our journey at Barcelona, going to the beach and famous buildings, and of course acting like the 9th graders we were in our hotel room. These are all great memories to me, and I assume for everyone else too. However this would have never been the amazing journey I know now without the help from my fellow team mates and the support my parents have showed. I’d like think that my journey has just begun, in ToC I will meet more people, make more friends, and create more unforgettable memories with my new friends and fellow teammates. But with all honesty, it’s been one of the greatest 9 days I have spent in my life, and I expect my time at Yale would be even better.